.. if you have Gate City Guard, Old Guard or other memorabilia, please send photographs and discription for this page . click here to submit .. 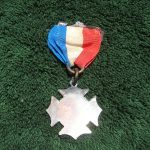 Photos of the actual 1911 Peace Monument medal in our archives I photographed in 2015. 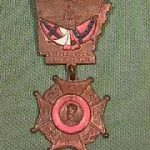 – John D.
The upper of the Arkansas shaped badge says 21st reunion. Lower says Little Rock, May 16-17-18. 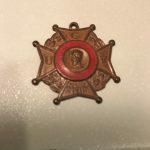 The round one says 1911 and Major General P.R. Cleburne. One your members identified for me that this was produced by Camp Cleburne. I was able to do more research and discovered something that should have been obvious. These two pieces are not two badges, but one that would have been connected by a loop. Now the date makes sense. May 16,17,18, 1911. 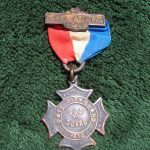 With a little more research I actually found a photo of the complete badge on one of the Cleburne websites. Therefore, I am assuming my great grandfather went to this reunion in Little Rock. Seems like a long way to go from Casy Springs, Ga. However, his son and family lived in Shreveport, Louisiana. Therefore, its very easy to understand his attendance there as well at the big event in Atlanta. He was of course a veteran of the Civil War. 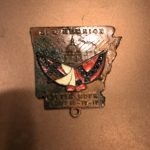 Another interesting thing about the Cleburne badge was that it was made by the Whitehead & Hoag Co. which was a very prominent maker of these type badges. For a look at the video story on the 1911 Little Rock Reunion, see the YouTube video at https://youtu.be/x3_X1i_wxUo. Arkansas Badge I on the internet. 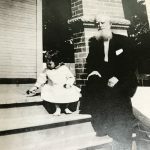 The second is of Albert T. Weaver Mr. Smallwood’s great grandfather who fought in the Civil war taken in Shreveport around the time of the Little Rock reunion. The little girl is my mother. She was born in 1909.